You’ve probably picked up in the IT press that the developers of TrueCrypt, currently integrated within BackupAssist, are no longer actively developing the software. A recent independent audit published by iSEC has not identified any security flaws in TrueCrypt, however at some point in the future, it’s likely vulnerabilities may creep into it. DISCLAIMER: We’re not suggesting you need to switch away immediately and ultimately fully expect to see a new encryption application integrated into BackupAssist. The major limitation I came across using Bitlocker through the Windows GUI – is that I don’t see it as practical for most administrators because it requires you’re permanently logged in order for it to manage the locking and unlocking of your drives. In my tests I was looking for a way to automatically unlock the encrypted drive each time the job runs, and then re-lock it once the job has completed. 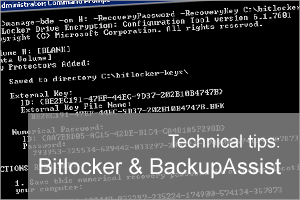 In this example I will walk through the process to set up a BackupAssist File Protection job to a single USB Hard drive encrypted using BitLocker. Before we can use BitLocker it needs to be installed within Windows. 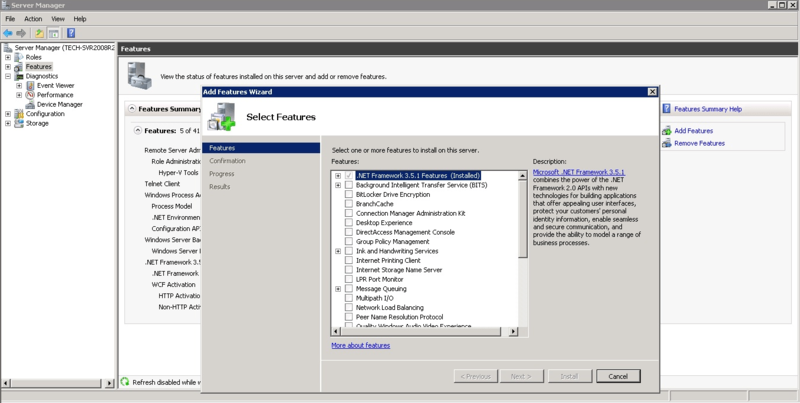 Select the Add features option from the Features Summary Help menu. Tick BitLocker Drive Encryption and select Install. BitLocker is pre-installed on Windows 7 and 8/8.1(Enterprise edition only) and accessed using the Control Panel\System and Security. Before you encrypt the destination USB drive make sure it is freshly formatted as NTFS. For destination drives to work with Bitlocker, they must be first encrypted. I recommend using the command line tools because (bizarrely) using the usual windows GUI method does not appear to then make it possible to unlock using the command line tool. “H:” is the drive letter of the destination drive “C:\bitlocker-keys\” is the folder where you want to store a copy of the encryption KEY. The encryption keys you create are important and you will ned them to encrypt and decrypt the encrypted hard drive so keep a copy safe and secure. To make this easier to identify in the future, I recommend renaming this file to the media label of the destination drive. i.e “Daily 1.BEK“. Please note the contents of the file must remain exactly the same! We’re not going to use this password as it will be shown later in plain text and isn’t secure but you may want to take a copy of this key and store it in a safe place as you can use it to easily unlock a drive with any server running Bitlocker without requiring the key file. We now should have a working H: that we could back up to but we need to configure BackupAssist to prepare this drive as well as add some custom scripts to mount and dismount the encrypted volume automatically when the job runs. 5.Under the ‘Prepare media’ section be sure to prepare the “Daily 1” disk. 6.Continue to the end of the job and Save. 7.Next edit this newly created job and open the scripts section. 8. Now before we test this job we need to manually lock the encrypted drive (remember we unlocked it early on). Step 5 Test the job. Within BackupAssist run the job and keep an eye on the Windows Explorer window. You should be able to see that before the jobs starts the encrypted drive is shown with a yellow Locked padlock..
..finally returning to a yellow locked padlock after the job has completed. I have tried to keep this guide as simple as possible, so kept to using a single destination drive scenario. However as I appreciate it’s common to backup to a pool of disks on rotation, I’ve covered this separately below. When using multiple destination backup disks, each will need to be locked using the method above and all will have a unique key file created. This is very important as you can only unlock the disk with the key that was generated when you first encrypted it. This is one of the the main reasons I rename to something more understandable at the first step! So the process is to go through one disk at a time and rename the key to match the disk you are working on. Lets say you have 5 disks (Daily 1, Daily 2, Daily 3, Daily 4, Daily 5) you should then have 5 ‘.BEK’ files labelled Daily 1.Bek , Daily 2.BEK etc. under the C:\bitlocker-keys\ folder. The next step is to manually unlock and prepare each disk as described above. The plan is to fully integrate Bitlocker integration into future releases of BackupAssist so in the future this process should be significantly easier, but if you are looking for a way to integrate Bitlocker right away, I have had good success using this method. However I should point out this is still work in progress so you should fully test this method before you use it for live system backups.